Our Company is exporting Indian Virgin Remy Human Hair to US, Europe, Jamaica, South Africa, and Brazil. We are the expertise in manufacturing and exporting in Human Hair products, which are commonly known Straight Machine Weft Hair Extension, Wavy Machine Weft Hair Extension, Curly Machine Weft Hair Extension, Clip on Hair Extension and Pre-bonded Keratin Tip Extension. We have covered our position as one of the leading manufacturers and suppliers of original human Hair to all over the world. We are having well experienced team for quality control, which makes possible us to develop best quality weft and braid human Hair. Our hair extension products are smells good, no shedding, tangle free and healthy hair. Over the years, we have provided real human hair products at the most affordable prices and have gained the trust of the buyers. Please find our website for natural curly, wavy, straight hairs. specialties: we can supply indian remy virgin hair, hair in colors/blonde machine weft in silky stright, wavy, deep wavy, curly deep curly, body wave etc. , textures and i,u,v-pre blonded tips in all colors available. 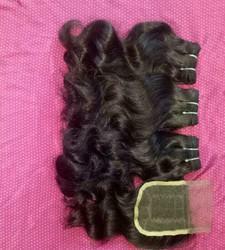 Looking for Human Hair Exporter Chennai ?